Lines and curves - mean different things to different people. If you are looking for a partner that can help you make sense of it all, you have come to the right place. Converting Wild ideas to business results is what we do best. Get the advantage of decade of Technology experience. Customised and Unique website or branding is our forte. We help business stand out and project them to the world. We help enterprises decode design, technology and social media to harness the potential and make sense of it all. 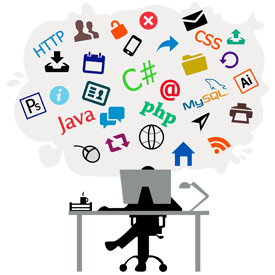 Get all the services related to web presence and web based application and seamless integration between them from one single source. From Logo design to iPhone Apps...and everything in between. Not just a lump of CSS & HTML cooked in Photoshop. A structure that makes sense to a customer and enables you to communicate, project and conquer. The new lingo of the young and the restless... Your ringing presence on the 3 inch screen that controls the world today. Icon that declares your presence to your king... till they become the slave of your quality. Picture is worth a 1000 pixels! Let each pixel be picture perfect and tell the story that you want to tell the world. Hire us for a project or Hire a resource in our premises on dedicated basis. Get Output minus all the other headaches at a fixed monthly cost.